Envision Fitness is committed to empowering you. Whether you’re an elite athlete or have never set foot in a gym before, we’re here to give you the support you need to make your vision become a reality. Our objective is to show you, and the communities we are a part of, that you have the power to live the life you seek. Through our individualized personal training classes and our high-intensity boot camps, we are building a community of people who work together, help one another, and push each other to reach higher. At Envision Fitness, it doesn’t matter if you are a trainer or a member; we are a community, and each of us is here to lift each other up. Are you ready to join us? When you enlist our help, you are not only getting a workout experience – you are choosing to become a part of something bigger than yourself. It is this innate sense of community that enables us to succeed. Let us help you make the change you’ve been thinking about for a long time now. Envision your potential – book a free fitness consultation today. SERVANT LEADERSHIP: A true leader is someone who puts those who place their trust in her or him first. Someone who can coach and inspire those same people to accomplish great things as a team. We aspire to these fundamental principles as your fitness professionals and as ordinary people ourselves. COMMUNITY: Alone, a twig can be snapped in two; but together a bundle cannot be broken. We must remember we are stronger when we work together. Members and trainers alike, we are all here for each other. DISCIPLINE & CONSISTENCY: To make a change you have to start; to see that change you have to persist. This is why having the discipline to remain consistent each and every day is so crucial. Motivation is temporary and driven by emotion. Discipline will take you to the next level. What does discipline look like? Getting up at 5 am to workout or showing up at 5:30 pm after a long day's work – every single day. Working out is fun! It should be fun! But results are driven by discipline and consistency. Eric Weiner has been helping people improve their fitness capabilities since early 2013, after graduating from the University of Pittsburgh with a degree in Sports Medicine. He previously worked as a personal trainer at a corporate fitness center before branching off to start his own personal training business. 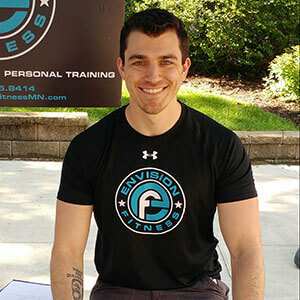 Eric created Envision Fitness in 2016 with a focus on helping his clients improve their overall health – physical and mental. Originally focusing on personal training, he decided to add fitness boot camp classes to the mix to foster a sense of community, servant leadership, and empowerment. The Envision gym in Hopkins offers fitness boot camp classes, individualized personal training classes, and nutrition coaching. Eric hopes to expand to more locations in the future as Envision Fitness grows. When it comes to fitness professionals, Eric believes the best trainers show empathy and compassion. Having invested in a personal trainer himself, he strongly believes in the profound impact they can have on your life. FOOD INTAKE: A healthy diet isn’t about eating less, it’s about eating smart. With Envision, you will learn how to eat in a way that is specific and unique to your own body and fitness goals. Together, we will devise tailored meal plans that are easy to follow, and develop a better understanding of what your body really needs. A combination of education, moderation, and the proper exercise regimen equals results. CARDIO: With aerobic training and other cardio exercises, we will help you maximize your results while boosting your calorie burn, heart function, and immune system. By managing your workout frequency, intensity, time spent, and type of exercise, you can hit your target heart rate, and, in turn, devise the perfect cardio plan to see the results you’re looking for. DIETARY SUPPORT: We believe in a “food first” approach; however, sometimes we cannot get everything we need through food alone. Let us teach you how to boost your fitness program and overall health with the right vitamins and supplements. When used properly, they can play a major role in reaching your fitness goals. We will guide you in choosing the RIGHT dietary support in your journey to results. RESISTANCE TRAINING: Building strong muscles through strength training will help you burn fat, increase your metabolism, and maintain healthy bones. All parts of resistance training (free weights, machines, cables, tubing, and exercise balls) are part of a complete program. Together, we will create a tailored and progressive resistance training program specific to you. PERSONAL ASSISTANCE: Through our personal training and fitness boot camp classes, we will be with you every step of the way, eliminating guesswork and clearing a path toward your goals in a safe and effective way. We will help determine the perfect mix of the five components, and develop a customized fitness program according to your own unique goals and current fitness status. By pursuing the five components of fitness with the help of Envision Fitness, you will avoid searching for answers and follow a direct path to your fitness goals! Ready to make a change in your life for the better? Book a free, 90-minute consultation with an Envision Fitness trainer! Looking for motivation? Check out our members’ Success Stories here!